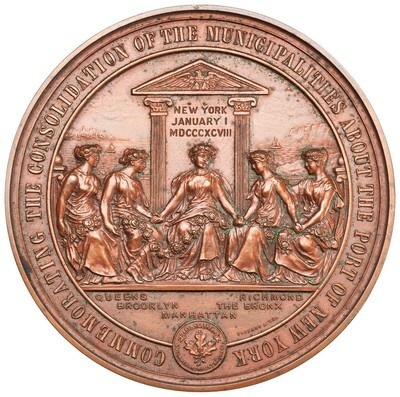 Obverse: COMMEMORATING THE CONSOLIDATION OF THE MUNICIPALITIES ABOUT THE PORT OF NEW YORK - Five seated female figures representing the five boroughs; below each is the name of the borough represented. 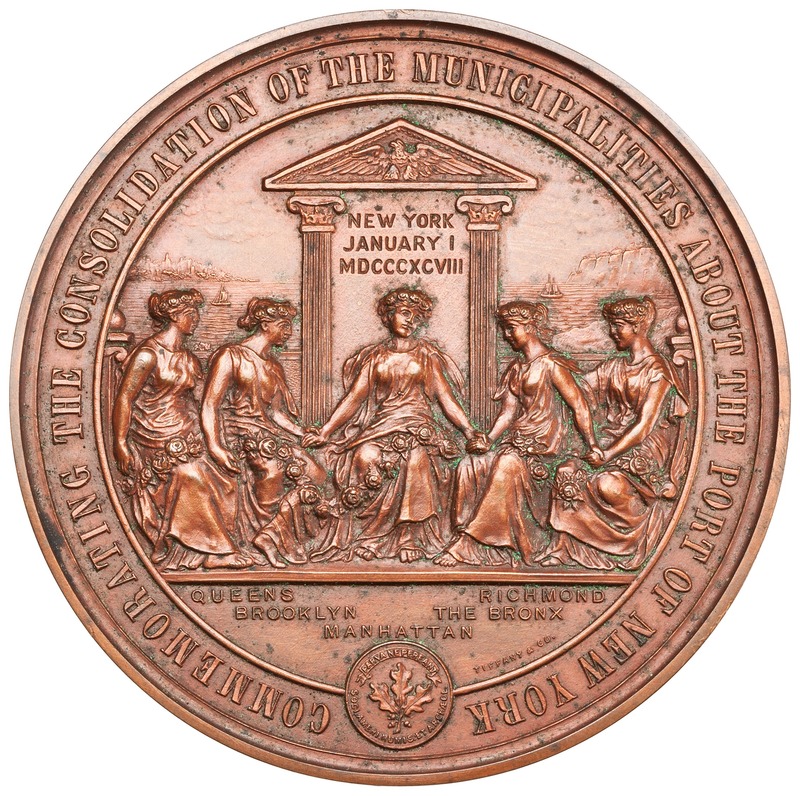 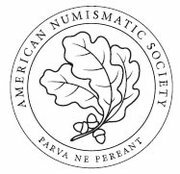 Behind the figures, within an ornamented pediment supported by two columns, is a tablet inscribed NEW YORK / JANUARY 1 / MDCCCXCVIII; in the background is a view of New York harbor, and below is the seal of the Society. 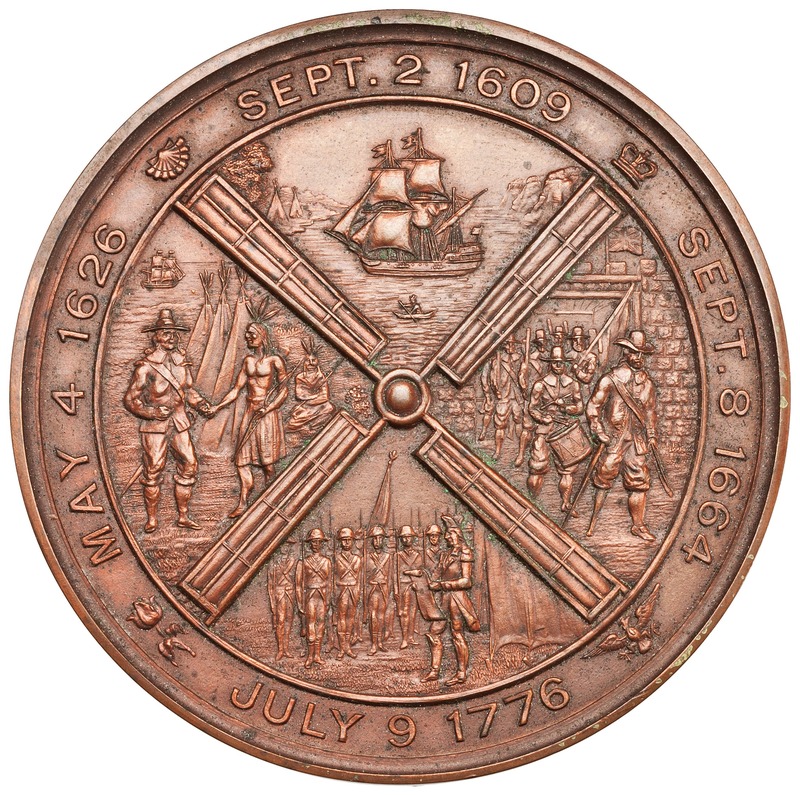 Reverse: (tulip) MAY 4 1626 (scallop shell) SEPT. 2 1609 (crown) SEPT. 8 1664 / JULY 9 1776 (eagle) - The arms of a Dutch windmill; within the arms are four vignettes depicting (left) Peter Minuit purchasing Manhattan Island from the Indians, (top) Henry Hudson's ship the Halve Maen, (right) the Dutch, led by Peter Stuyvesant, evacuating Fort Amsterdam, and (bottom) a Continental officer reading the Declaration of Independence to American troops. Along the rim, separated by symbols appropriate to the events, are the dates reflected in the vignettes.